Tuesday's edition of CNN's New Day featured a report very sympathetic to Texas Democratic Senate Candidate Beto O'Rourke, who hopes to unseat incumbent Republican Senator Ted Cruz during this year's midterm election. In a report aired on Friday's New Day and again on Saturday's CNN Newsroom with Fredricka Whitfield, CNN correspondent Ed Lavandera actually gave attention to a school district in Texas that already arms its teachers with concealed weapons and has them train in case they need to defend the school. On New Day, CNN hosts Alisyn Camerota and John Berman seemed skeptical after the report because the teachers had not yet had a chance to demonstrate that they could defend the school successfully as the pair failed to note that the fact that they have not been attacked yet could be evidence of deterrence. As Wednesday night's Anderson Cooper 360 on CNN was giving live coverage to the riots in Charlotte, North Carolina, correspondent Ed Lavandera was knocked to the ground by a rioter on live television at 9:16 p.m. ET as he recalled that police had just recently used tear gas to get rioters to move further from the Omni Hotel. As Charlotte, North Carolina was being torn apart on Wednesday night, cable networks CNN, the Fox News Channel (FNC), and MSNBC offered wall-to-wall coverage of the carnage and tense scenes that, during the 9:00 p.m. Eastern hour, resulted in the one civilian being shot by another civilian and injuries to roughly a dozen police officers but MSNBC saw no reason in that hour to inform their viewers of the rampant looting at hotels and storefronts by the Black Lives Matter protesters. Friday's Erin Burnett Outfront on CNN ran a report by correspondent Ed Lavendera focusing on negative reaction to a new law in Texas that will allow concealed carry permit holders over age 21 to bring their guns onto college campuses to enhance security. The report was heavily slanted toward airing the views of those who wish to keep colleges as gun-free zones as Lavendera included six soundbites totaling 44 seconds from opponents of the law, with only two soundbites totaling 12 seconds from those who want to allow guns on campus. One of the only two soundbites on the pro-gun side was only about one second long. While NBC's Maria Shriver on January 15 credulously repeated how the Texan's "personal story resonated across the country," Cooper explained that "as compelling as it is, doesn't stand up to the facts." In commercials and campaign events, Davis has been insisting that at age 19, she was a single parent who lived in a mobile home. AC360 reporter Ed Lavandera clarified, "It turns out Davis separated from her husband at age 19 but didn't divorce until she was 21. And the trailer court, which has gotten top billing in her bio, the reality is she may have only lived there for a few months." On Wednesday's American Morning, CNN's Ed Lavandera focused on the "overwhelmingly white" turnout at the rallies sponsored by the Tea Party Express organization and played up the criticisms that there is an "anti-minority undertone" at the demonstrations. Lavandera, who is covering the Tea Party Express' cross-country tour, highlighted the race issue from the beginning of his report, which first aired 13 minutes into the 8 am Eastern hour: "The crowds turning out for the Tea Party Express rallies are overwhelmingly white. Is this lack of diversity a problem for the Tea Party movement? We're taking a closer look." The correspondent noted some of the apparently "subtle efforts to make the tea party appear diverse," such as a hip hop performance and speeches by black tea party activist Lloyd Marcus. Marcus stated that "there's not a lot of black folks here, basically, because they haven't seen the light yet. They are still hypnotized by the first black or African-American president. But they haven't really looked at the man and what he's doing." This assertion is supported by a Gallup poll from earlier in March that found that President Obama's approval rating among blacks is at 89%, down slightly from 96% in August 2009. 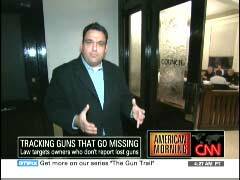 CNN's Ed Lavandera misrepresented "lost and stolen" gun ordinances passed by municipalities in Pennsylvania as "straw purchase ordinances" on Wednesday's American Morning, and hinted that gun rights supporters were somehow extreme. Lavandera also omitted that county and local governments in Pennsylvania cannot pass gun laws due to the state legislature preempting this area of regulation. The correspondent's report was the third installment in a continuing series on American Morning titled "The Gun Trail" (on Tuesday, he touted what gun control activists call the "iron pipeline," and omitted that gun straw purchases are illegal under federal law). Lavandera highlighted a push in Pennsylvania to pass the "lost and stolen" ordinances. He began with two sound bites from Jana Finder, a coordinator for Ceasefire PA, a gun control organization. The correspondent never explicitly mentioned Ceasefire PA's gun control agenda, just that it had "launched a grassroots campaign to get local governments to sign on to what's become a highly controversial law called 'lost and stolen' ordinances....The ordinances require gun owners to report if their weapons have been lost or stolen, usually within 24 hours." 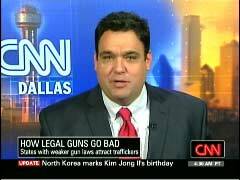 CNN's Ed Lavandera highlighted what gun control activists call the "iron pipeline" during a report on Tuesday's American Morning, where guns are obtained illegally through straw purchases, a felony offense under federal law, and smuggled to criminals who cannot legally purchase them. Lavandera never made it clear that such straw purchases are illegal during his report. Anchor John Roberts introduced the CNN correspondent's report, which is part of a series titled "The Gun Trail." Roberts explicitly referenced the "iron pipeline," where guns obtained through illegal straw purchases in the Southeast are smuggled up the I-95 corridor to criminals in the Northeast: "Today, our Ed Lavandera is on the front line, a state at the start of the so-called 'iron pipeline'- a pipeline that could end on your street." Wednesday’s American Morning program on CNN ran a segment by correspondent Ed Lavandera on the practice of corporal punishment for students, which featured a Texas student speaking out against paddling who wore a red T-shirt -- which featured the communist hammer and sickle symbol, an insignia popular with regimes which presided over the torture and murder of hundreds of millions. Lavandera also ran three sound bites of individuals speaking out against the practice versus one principal who is in favor of it. Lavandera interviewed student Joe Cancellare, who received "two swats" from a paddle at his Alpine, Texas school after being sent to the principal’s office for flinging rubber bands. Cancellare and his mother Andrea Cancellare, who was also interviewed, both object to this form of punishment. Lavandera stated that Ms. Cancellare "had earlier written a letter to the school expressing her vehement opposition to corporal punishment, and demanding that her son be exempted from the practice."